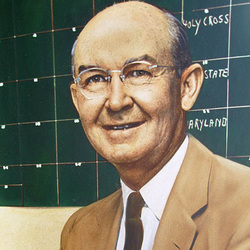 Coming to the Hurricanes in 1937, Jack Harding served 11 years as head football coach and directed the athletic department from 1948 through 1963. He was inducted into the UM Sports Hall of Fame as part of its inaugural class in 1967. A 3 sport star at the University of Pittsburgh in the twenties, including playing football under legendary coach Glenn "Pop" Warner, in the same backfield as future UM football coach Andy Gustafson, he played minor league baseball in the St. Louis Cardinals organization. But the lure of a coaching career ended his big league aspirations. He served 11 seasons as head football and basketball coach at Scranton University, his success leading to his appointment as head football coach in Miami in 1937. Harding's great 1938 eleven rates among Miami's best, while his '45 Hurricanes stunningly whipped Michigan State, Auburn, North Carolina State, Clemson and Florida to gain the glitter of an Orange Bowl bid--a game in which Miami triumphed over Holy Cross in a story-book finish still hailed as one of the great bowl thrillers of all time. After piling up a record of 54 triumphs, 32 defeats and three ties in nine coaching years (Jack served two years as a commissioned officer in the U.S. Navy during World War II), Harding retired at the conclusion of the 1947 season as head football coach to lend all his time to directing UM's overall athletic program. Harding served as state chairman for the National Football Foundation and Hall of Fame. He was inducted into the UM Sports Hall of Fame in its inaugural class of 1967. He was inducted into the Greater Miami Chamber of Commerce's Hall of Champions in October, 2009. Each year, the Jack Harding Award goes to the Most Valuable Player on the Hurricanes football team. The award, given since 1964, is selected by the players and coaches, considered the highest honor a player can receive from his teamates.